35mm Clear with Silver Solar Inserts. Solar Heat reflected = 80%. 35mm Clear with Gold Solar Inserts. Solar Heat reflected = 85%. 35mm Bronze with Gold Solar Inserts.Solar Heat reflected = 86%. 35mm polycarbonate sheets are UV protected. U-Value for 35mm Polycarbonate = 1.2W/2mK (a significant advantrage versus 16mm polycarbonate sheets with Solar Inserts). 35mm Polycarboate sheet with solar inserts provides the best combination of heat insualtion (retains heat in the winter) and solar reflection (keeps cool in summer). Main application: conservatory roofs. Polycarbonate Panels are guaranteed for 10 years. Polycarbonate glazing panels are simple to fit. 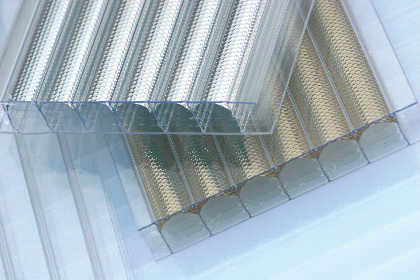 Omega supplies a range of Glazing Bars and Fixing Buttons to secure the panel. As well as Multiwall Polycarbonate Glazing Sheets - Standard Rectangles • 35mm Multiwall Polycarbonate Glazing Sheets with Solar Inserts - Standard Rectangles Omega Build supply a range of roofing components such as roof lanterns, roof domes, diy conservatory roof kits, polycarbonate roofing sheets, polycarbonate canopy kits, door canopy kits and much more. I would recommend your affordable products (Multiwall Polycarbonate Glazing Sheets - Standard Rectangles | 35mm Multiwall Polycarbonate Glazing Sheets with Solar Inserts - Standard Rectangles) to anyone else considering this product, as it has been superb. Omega Build Shop | Multiwall Polycarbonate Glazing Sheets - Standard Rectangles | 35mm Multiwall Polycarbonate Glazing Sheets with Solar Inserts - Standard Rectangles. You are viewing Multiwall Polycarbonate Glazing Sheets - Standard Rectangles | 35mm Multiwall Polycarbonate Glazing Sheets with Solar Inserts - Standard Rectangles, buy online today!